Part I of "A Puck Drops"
Part III of "A Puck Drops"
Part IV of "A Puck Drops"
Radio was pioneered in Canada with the first broadcast originating from a station in Montreal in 1919. Between 1922 and 1929 the number of radios in Canada rose from 10,000 to approximately 400,000. 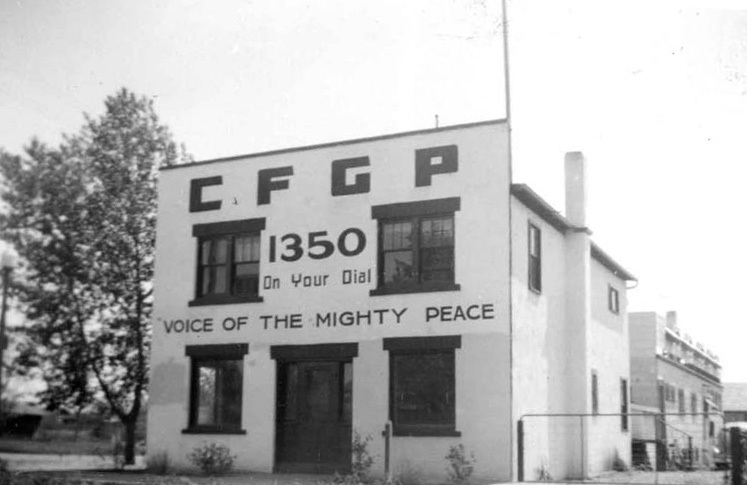 Local radio, CFGP was introduced to Grande Prairie with considerable fanfare in 1937. Long time CFGP staff member Gordon Pearcy recalls that an invitation was sent to English Royalty to attend the opening of the station. Much to everyone’s surprise Prince Andrew and Lady Sarah accepted the invitation and attended the inauguration. To Sarah and Andrew it must have seemed as if Grande Prairie was perched on the edge of the world. What attracted them to attend the event is unknown – maybe a sense of adventure. In an article under the label of “Potpourrie” in celebration of Grande Prairie’s Centennial by Bill Scott, the inauguration of CFGP is hailed as one of the top five news stories of the 20th century. He goes on to report that prior to CFGP “… knowing what was going on “outside” was mainly dependent on railway telegraph, snippets in the town’s two weekly newspapers, Edmonton dailies arriving at least a day late on the NAR or flown in via United Air Transport, or static-laden broadcasts from Edmonton stations CJCA and CFRN.” For locals who did not own one, the purchase of a radio became an immediate priority following the inauguration of CFGP. Depending on the model a radio could be purchased for $35.00 and most were battery powered (six volts in larger models), as access to electricity was limited. As for programming there were soap operas such as Gang Busters and Charlie Chan. Music was especially popular (Big Band, Hawaiian, classical, and western) and time was provided for local talent. On a blistering cold winter day in 1938, ten-year old Margaret Neufeld and her cousin Mary Rempel walked to the CFGP station north of town (2.5 kms) to compete in a local talent show broadcast on the station. They won the competition and their prize was a recording of their duet. Margaret still has the record. Gordon Pearcy recalls that an important public service provided by the station enabled people to “come to the station with messages for their folks in rural areas because phones were a rare commodity. We kept people informed about patients in the hospital with daily reports on their condition and when they were to be discharged.” (Tribune). Over the years one of the most listened to programs was Hockey Night In Canada with Foster Hewitt and later the Peace Country’s own Foster Hewitt, Fran Tanner’s live coverage of local hockey in the WBHL. Between the newspaper and CFGP local hockey has received remarkable coverage over the years – not just games and the advertising of hockey events but by following the fortunes of players who left Grande Prairie to play junior or professional hockey elsewhere. Shortly after it opened CFGP reported live broadcasts of important local hockey games sponsored by Frontier Lumber Company and to facilitate the broadcasts a gondola was constructed in the rafters of the Wapiti Arena. That gondola became Fran Tanner’s nest for many years: his office and “tea room”. Although the rumour was rebuffed it was alleged by some that Fran brought something stronger than tea to the gondola. “On the Sidelines” the Herald’s first weekly sports column appeared in 1938. In one of his articles reporter Bud Powell accused the first play-by- play hockey announcer of being too unemotional. It was never said of Fran Tanner who later reigned in the gondola that he was too unemotional. Additional media and communications technologies that appeared during this period included the telephone and movies. Grande Prairie’s first phones were installed in 1918, the year WW1 ended. Telephone operators manually connected callers. Prior to phones one could connect to points along the railroad by sending telegrams via telegraph operators at railroad stations using Morse code to send messages. “In WW11 I recall that an Uncle at home sent telegrams to his brothers overseas on Christmas day. I can’t recall the number but a telegram was limited to a certain number of words. For my uncles overseas to receive the message as it was sent, arrangements were made ahead of time by letter for the boys overseas to be at a certain location at a certain time to receive the telegram. It was exciting and comforting for the boys away from home to receive a direct message from family members on Christmas Day. It was mesmerizing to watch an agent skilled in the use of Morse code tap messages on a single key translating words into dots and dashes. Receiving the dots and dashes was an operator at the other end of the line who decoded the message. It was high tech at that time.” (Ron Neufeld). The first moving picture shown in Grande Prairie was at the Pioneer Theatre where it became a weekly event in 1914. It was not until 1926 that the first freestanding movie theatre was opened. Other developments in the twenties included the formation in 1927 of a separate school system and in the same year St. Joseph’s Catholic School was built. For many years the school maintained an outdoor rink and from time to time there was competition between teams from the Catholic and Public School. Montrose outdoor rink - left to right-Roy Wright, Rusty Black and Charlie Turner. 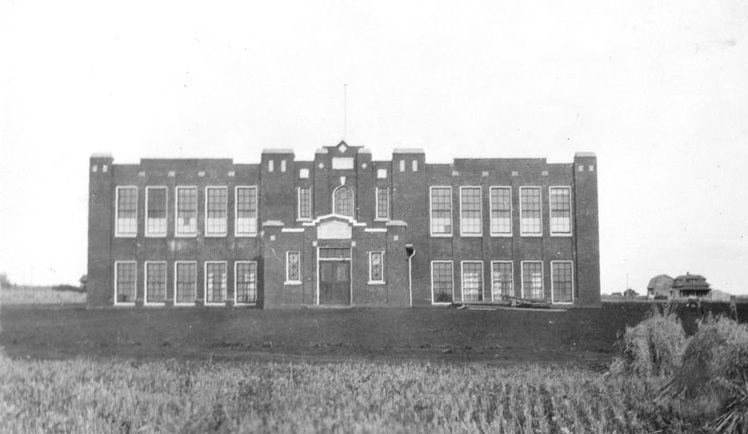 In 1928 the Grande Prairie High School was constructed adjacent to Montrose Public School and the following year the Grande Prairie Municipal Hospital was opened. In 1931 a ferry was installed to facilitate transportation across the Wapiti to Grovedale and in 1932 during the height of the depression an RCMP detachment was established. In spite of the wet blanket the depression had thrown over the economy in 1929 as the end of the 1930s approached the town was transformed due to the effects of WW11. Likewise hockey gained momentum due to the leadership of Bert Bessent, Charlie Turner Sr., Leonard Henning and other volunteers mentioned earlier. As we will see, hockey and shifted into a higher gear following WW11 when the veterans returned home. 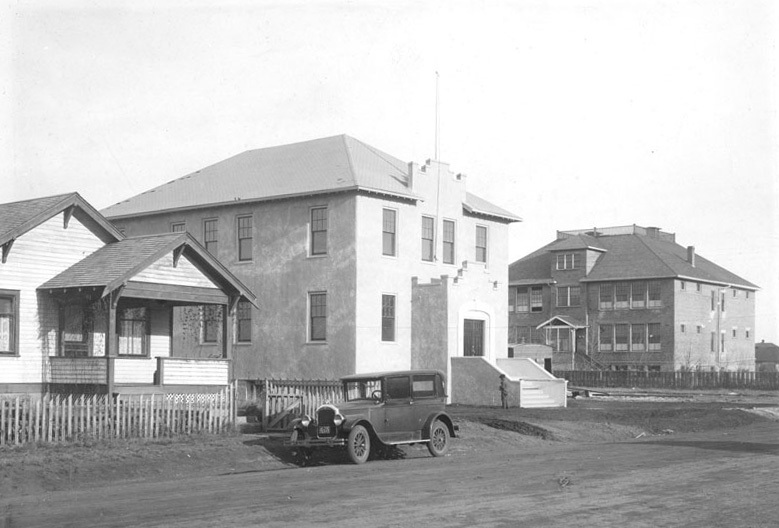 Grande Prairie’s first Court House, with Montrose School in the background. Constructed in 1925, the Court House was the first provincial Court House north of Edmonton. The Court House was a gathering place for young people and later a number of WW11 veterans reported that their decision to join up was made on the steps seen above. There are many interesting stories related to the determination of hockey teams to overcome seemingly insurmountable weather conditions to play a scheduled game. Before the advent of cars or even later when auto transportation was not possible due to impassable roads or inclement weather the players used horses and sleds. Legend Max Henning recalls playing on a team with Jimmy Miller during the early 1930’s. Without access to a car or possibly because the roads were impassable Jimmy’s Father harnessed his team of horses, and in the comfort of a sled filled with hay and hot rocks drove the boys to Sexsmith for a hockey match. It’s not quite the magnitude of the 320 mile epic trip of the Peace River Team told in Episode One but a lengthy venture none-the-less - approximately five hours one way - about the time required to drive to Edmonton today. Hay would have been carried to feed the horses while the boys played their game and upon returning home after what would have been an eleven to twelve hour venture, Jimmy’s Father’s day would not have ended until he had unharnessed, fed and watered the horses. Jimmy’s Father deserved a medal. When cars replaced horses, snow shovels and chains were standard equipment and of course everyone was pressed into action to push or pull a vehicle that became buried in a snowdrift. That was not uncommon. When team budgets made it possible busses were chartered and even they had to be shoveled through snowdrifts from time to time. It attests to the remarkable ability of the body to recover from the energy spent to move tons of snow and then play a hockey game. To get home they had to go through the same process – there was no team budget to spend the night in a hotel. In Max Henning’s prime he was the designated “heavy lifter” when it came to heaving vehicles out of snowdrifts. 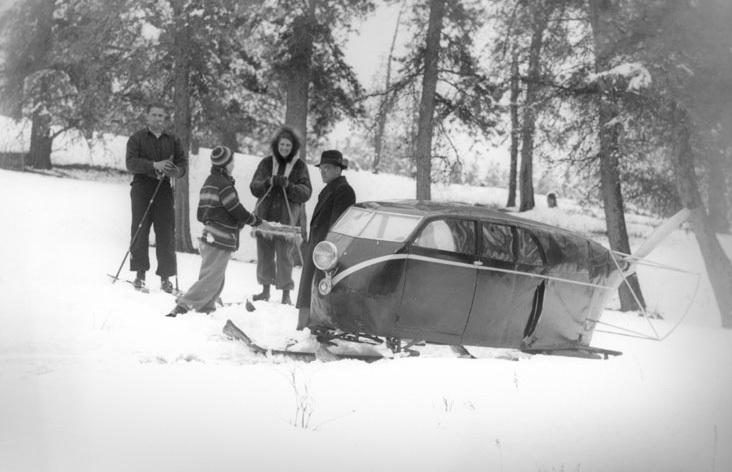 In 1940 a newspaper account tells of a snow plane that was pressed into use to transport a Grande Prairie team to Beaverlodge for a game when the road was impassable for cars. It was an unusual contraption mounted on skis and driven by a propeller fixed to the rear of the machine. Add wings and it may have become airborn. South Peace Regional Archives. Circa 1940. Another unusual transportation story pertains to a famous train ride for hockey fans intent on watching a January game in 1939 between the Grande Prairie Red Devils and the Hythe Maple Leafs. The transportation special departed from Rycroft and including Grande Prairie it made twelve stops to pick up passengers. All told 312 fans boarded the train, 200 of them from Grande Prairie. That night six hundred fans packed into the tiny Hythe arena to watch the Red Devils defeat Hythe by a score of 3 – 1. The Herald reported that credit for arranging the excursion special went to Harold Oxley, Manager of the Grande Prairie Red Devils. Many were pessimistic about the number of fans that would make the trip. “Giving him financial as well as moral support were a group of businessmen and private citizens of the town who signed their names on the dotted line to guarantee the cost of the train.” Attached to the train was the private coach of NAR Superintendant, Mr. Deacin. Upon seeing the crowded train he offered his private coach to help accommodate passengers. Considering the success of this venture it is surprising that the hockey train special, failed to become a tradition. Hockey Legend Johnny Macdonald was born in 1889 but of the remaining twenty-one current Legends fourteen were born during the period covered by this episode. Hockey as it exists in Grande Prairie today owes its vigour and reputation to the builders, a referee, a media specialist and players from this era and have “truth that is stranger than fiction” tales related to hockey during their youth. There was evidence that prior to WW1 attempts were made to organize leagues but those efforts were thwarted by the war. Interest in creating a league was revived during the twenties and thirties but there is no evidence of any successful organization involving several towns until the 1938 – 39-hockey season. The pattern throughout the period 1918 – into the mid thirties consisted of sporadic games and hockey tournaments throughout the winter between nearby towns. These events involved both senior and minor age players. As described earlier, hockey tournaments were held annually in conjunction with the Grande Prairie Ice Carnival that was a welcome reprieve from the monotony of a long cold winter. The carnivals were elaborate events – some lasting up to five days. 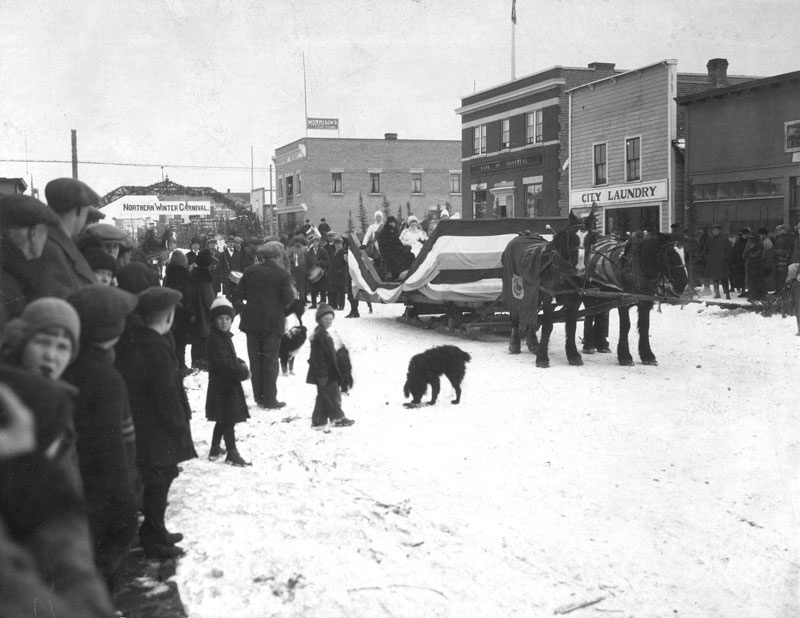 They included parades of floats pulled by horses along Richmond Avenue, pageants on the ice, figure skating, clown acts, masquerades, skate races and hockey tournaments against teams from neighbouring towns. 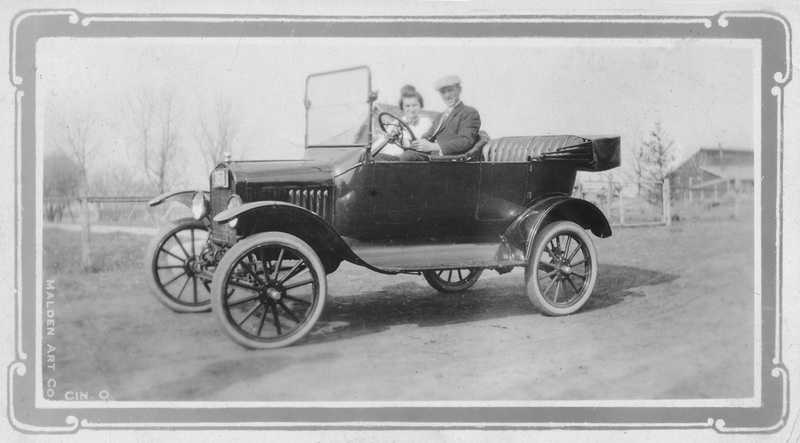 Johnny Macdonald and his wife Sylvia in a vintage vehicle. The Grande Prairie Senior team had first dibs on the Wapiti Arena but when there was no conflict with senior games or practices it was available for public skating, figure skating and minor hockey. Billy Bessent reports, “It was a big deal for the midgets to play in the covered arena.” The Wapiti Arena, constructed in 1919 was the only covered ice surface north of Edmonton, the largest building in the Peace country and likely the northernmost covered arena in the world. It was by no means a glamorous structure. In it’s life span of twenty-seven years it never enjoyed a coat of paint and according to Max Henning the wind whistled between cracks in the boards such that spectators may just as well have been standing out of doors. A lean-to on the north side of the building covered three sheets of ice for curling. There were some structural problems with the arena and several years into its use it was up-graded and the seating capacity increased to accommodate one thousand spectators. Max’s comments aside, the construction of the Wapiti Arena had a profound effect on the game especially for spectators who were able to watch games with some protection from the elements. Before the Wapiti Arena was constructed most games, senior and minor hockey alike were played on an outdoor rink on the grounds of Montrose School. It was a rink with boards and an outbuilding to provide shelter for putting on skates and hockey equipment but there were no bleachers and no protection from the weather for spectators. Other surfaces that were used included Bear Creek, nearby lakes and ponds and later an outdoor rink beside the Catholic school. Hockey Legend Henning reports that when the arena was not available Physical Education Teacher and GP Hockey Legend Bob Neufeld regularly used the outdoor rink at Montrose School for High School hockey. In the fall skaters and hockey players relished the onset of cold weather without snow when lakes and ponds would freeze and provide a clean expanse of ice. Before putting on skates and heading onto a lake pond or creek it was customary for brush to be gathered and a fire built inside a circle of logs that were used as benches to lace up skates in relative comfort – relative comfort meaning that one side of the body roasted while the other side froze. The fire may have prevented hypothermia for careless skaters who ventured onto thin ice. It was not an uncommon occurrence for a skater to experience a frigid baptism upon breaking through the ice. Shell ice was common along shores of lakes and ponds and one had to watch for thin ice covering muskrat leads. Without running water, flooding rinks was a challenge. Max recalls that a Mr. Campbell had horses that were stabled near the water tower adjacent to the rink. Pulling a water tank on a sled, he delivered water throughout the town and supplied water for both outdoor rinks and the arena. According to Max, horses were used to flood the outdoor rink at the school. 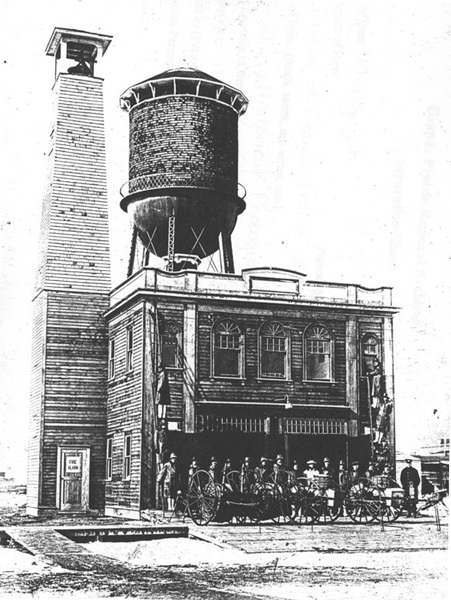 The cost of hauling water from the water tower to flood the rink was $4.50 per day – 75 cents per tank. Years later when the Volunteer Fire Department was organized, water services became more widely available and the Department obtained a pumper truck. Volunteer firemen would regularly tour the town and flood outdoor community rinks. But we’re getting ahead of ourselves – that was much later. Russ Burgess, Claude O’Keefe, Johnny Macdonald and Billy Bessent are names of rink managers over the years. As described earlier, managing the rink was Billy Bessents first job upon returning from the war and he hired returning veteran Fran Tanner as his assistant. Rink mangers took great pride in the quality of ice they made. They used a manual process involving hot water from a wood fired boiler. A large barrel mounted on a sled was filled with the hot water and spouted a cylinder of mist as it was pulled to the ice. Connected to the bottom of the barrel was a perforated pipe that ran horizontal to the ice. A burlap sack extended from the pipe to the ice to ensure even distribution of hot water that blended with the ice to form a smooth, seamless new coat. In spite of the primitive nature of this contraption it was capable of making good ice. However ice was dependent upon cold weather and at least once during this episode a league playoff series was cancelled due to warm weather. On the other hand, a sudden cold snap could cause the ice to contract and produce large fissures extending the length and breadth of the ice surface. Cracks in the ice were a hazard to skaters. Making good ice was a ticklish business. The seven years - 1929 – 1936 was an interesting period in the history of the Wapiti Arena. Frank Donald was described earlier as a well-to-do Grande Prairie businessman and sports enthusiast. According to the Tribune he purchased the arena in 1929 from the town for $2,000.00 and then, after some haggling over the price the town bought it back in 1936 for the same price it was sold to Frank in 1929. One might speculate that the arena was not a particularly wise business investment especially during that period: the height of the depression. On one hand it is likely that the rink failed to meet Frank’s expectations as an investment and undoubtedly it would have been a high maintenance project. On the other hand it is possible that people in the town and the City Fathers were unhappy with the manner in which the rink was operated. During his negotiations with the City Council to sell the rink back to the town Frank complained that he had spent $500.00 renovating the building and felt that this should be reimbursed but his complaint fell on deaf ears: the town remained firm in its offer and after some consideration Frank agreed to accept the $2,000.00 offer. During the time Frank owned the rink it was used in the summer months for sports events such as wrestling, and professional and local boxing. In an interview with Stan Neufeld Billy Bessent reports that during this period he and his twin brother Bobby became pro boxers. “We were about ten years old and Frank would pay us five dollars for fighting each other between bouts.” As far as Billy and Bobby were concerned boxing was easier money than selling Edmonton Bulletins on the street. The local newspaper reported that the “Billy/Bobby” scraps were the most popular events on the fight card. Billy and Bobby Bessent boxing on the back of a truck to promote boxing and wrestling events in the city. It looks as if one of the twins is taking a right to the jaw. Max Henning described the hockey equipment that he and his friends used during the depression. “If we had a stick and a puck we felt lucky. When a senior player broke a stick during a game and tossed it over the boards we would rush to pick up the pieces and wire or nail together the pieces as best we could. For shin pads we shoved magazines into our pant legs and tied them in place. I remember my first pair of skates. My Dad bought them for me but they were too big because he did not want me to grow out of them. He paid $4.95 – old tube skates. There was a hardware store where we could trade in old skates for new ones but many could not afford them so old skates were repaired. Later I remember getting a fancy pair of CCM skates with diamond shaped tubes. That was pretty special. The next week Charlie Turner bought a pair too. That made them even more special – an older player copying my move. Skating and playing hockey in ditches and sloughs was the thing to do when I was a kid. There was minimal organization to it. We made do with a bit of help from our parents.” (Hockey Legend Max Henning). To put this into perspective – it is not uncommon today for a hockey player to invest $500.00 for a pair of skates. An article in a 1937 edition of the Herald in 1937 advertised the following fees for skating and admission to hockey games. “The fees to be charged for skating are as follows: season tickets family $8, including husband, wife and children under 21 years; adults $5.00, 14-20 years $2.50. Single admission 25 cents. Children under 14 years free from 4-6 pm. Public skating three times a week. Fees for admission to senior hockey games will not exceed 50 cents. Hockey splits on gates - 40 per cent to rink and 60 per cent to teams. Fees for admission to final league hockey games to be determined later but will not exceed one $1.00. Carnival income will be split 50-50 with the carnival committee. Compare fifty cents to watch a senior hockey game in 1937 to $15 weekend to watch the Junior Storm play today. South Peace Regional Archives: Circa 1937. 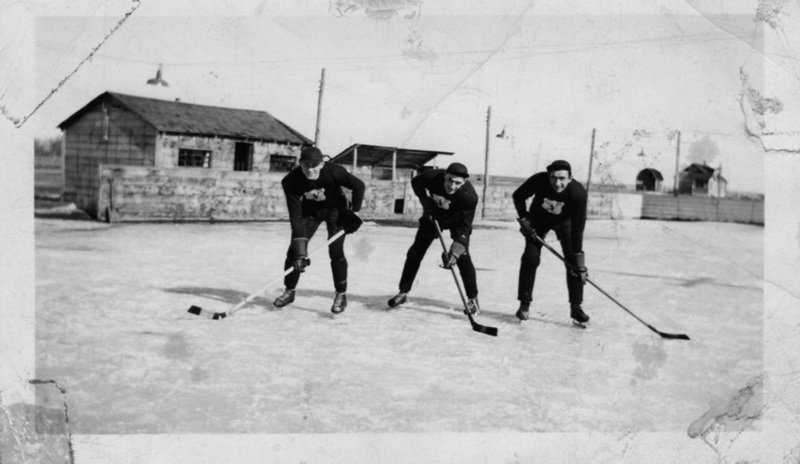 Although disposable income was scant for many residents of Grande Prairie during the thirties Billy Bessent, in an interview with Stan Neufeld reports “Any time our midget team played in the Wapiti Arena we filled the rink to the rafters. That was in 1938-39 and along with Max, myself, and brother Bobbie we had Cliff Wright, Ernie and Eddie Nelson. Charlie Turner was our coach.” It is clear that hockey was an important recreational activity and it received strong support from the community in general including parents, businessmen, and the media. The only appearance of commercialism in the game during this era were trophies donated by merchants in the town and a brief period described later when an Athletic Director was hired. 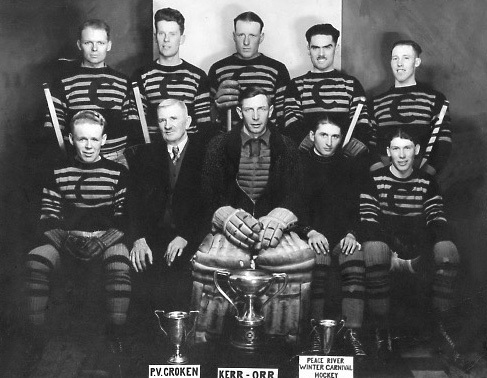 The record indicates that teams played for the Kerr/Orr Cup (Hardware Store), the Croken Cup (General Store), the Utilities Cup (Power Supplier) and the Maple Leaf Petroleum Cup. It was sound advertising but no prize money was associated with winning a trophy. As noted earlier, parents volunteered to help organize the kids, arrange games and tournaments and provide transportation by horse and sled and later by automobile. The game was played for fun and fame – not fortune. As nearly as can be determined it seems likely that there was no regular hockey league in 1935. However, at a January meeting officers were elected to plan and guide hockey activities for the season. Well- known names about town that were involved included: Gordon Orr (Mgr. ), Jack Crummy (Captain) and Johnny Shields (Coach). Veteran players Shields, Crummy and Rusty Black agreed to provide coaching and leadership for younger players trying out for the Senior team. GP Hockey Legend Charlie Turner was among the young lads who registered to try out for a place on the senior roster and likely to make the cut. He was eighteen years old at the time and had played with the senior team at age sixteen. Teams that were listed to play for the Kerr/Orr and Croken Challenge Cups at the annual Ice Carnival were Peace River, McLennan, Sexsmith, Hythe and Beaverlodge, Clairmont, Wembley, Rolla, Pouce Coupe, and Dawson Creek. In 1936 the Grande Prairie Athletic Association (GPAA) was born and in 1937 it took over management of the rink from the town. The Association’s first President was Leonard Henning, Hockey Legend Max Henning’s father. The GPAA was responsible for both summer and winter sports activities and in November 1937 a decision was made to hire a full time “sports coach”. “One big aim, said Bert Bessent, is to have hockey played as it should be to develop the younger generation.” An individual with the interesting name of Phat Jones was the only candidate mentioned for the position. One of Phat’s credentials is that he had been listed on the roster of the Detroit Red Wings. Phat was on the job by November 18, 1937 and in an interview with a Tribune reporter stated “I have come prepared to give of my best in developing hockey, baseball, softball and other line of sport in Grande Prairie and district.” He went on to comment on hopes for a Winnipeg Hockey School. There is no indication that anything came of Phat’s proposal for a hockey school. Although his tenure was short-lived, Phat’s hiring, along with hockey trophies provided by local merchants were the first examples of commercialism in Grande Prairie sports.